A smile is a person’s greatest asset. In the modern world an aesthetic appearance is often the difference between success and failure in our personal, as well as professional life. A charming smile opens doors and breaks down barriers between You and a fuller life. This is why contemporary dentistry is focused to a large degree on aesthetics. Our specialists carry out every procedure in such a way, as to achieve not only the desired therapeutic effect, but also an aesthetic and natural appearance of the treated area. Appearance has become a key characteristic of each one of us – many patients dream of a perfect smile and our physicians strive to combine function and beauty with the values and individual needs of the patient. We know that a decision to change the appearance of one’s teeth is very difficult and important. Our specialists help patients through the procedure in order to achieve the most beneficial and satisfying solution for them, which will improve the appearance and aesthetics of their smile. The physicians ad Medicus gain their immense knowledge by participating in numerous courses, as well as through clinical experience. Every decision we make is a result of very thorough examinations and medical investigations conducted by our dentists. At our clinic we offer patients lamp whitening treatments incorporating the Polla Office material. The procedure takes 30 – 45 minutes. The method finds very broad usage. It is utilized to remove inner and outer dental stains. It performs equally well in the case of dead and naturally yellowed teeth or teeth with nicotine, age, food stains, or stains resulting from pulp trauma. The procedure is completely harmless to the enamel (it does not weaken the structure of hard dental tissues). In the experience of our clinical specialists, this method does not cause post-treatment hypersensitivity among patients. There are many methods of teeth whitening – it is possible to use overlay systems at home (whitening strips, various types of gels), as well as at the dentistry clinic. Unfortunately, conventional methods are not particularly effective at removing sediment created by coffee, tea and tobacco. They are also ineffective at removing stains caused by the use of medication and fluoride. The patented TouchWhite™ teeth whitening system is based on a Er:YAG laser wave length of 2940 nm, which is absorbed best by water. It eliminates the need to use any additional gel based absorbing particles for teeth whitening, as water is their primary component. What is more important, considering thermal loads, the TouchWhite™ procedure is the most effective and least invasive laser-aided method of teeth whitening available on the market. Due to the high absorption characteristics of whitening gels, the Er:YAG laser radiation is completely absorbed by the gel and does not penetrate the soft dental tissues or the pulp. 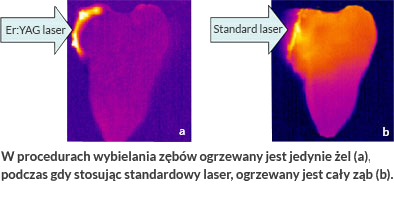 The laser’s entire energy is efficiently utilized to heat the gel. There is also no risk of accidentally damaging the tooth’s tissues, as the fluency of the laser in the case of every impulse is set to the lowest level compared to the tooth tissue ablation threshold. In consequence, the procedure may be conducted with exerting minimal thermal load on the tooth, while the speed of teeth whitening may be safely increased from 5 to 10 times.